One of the most interesting features of the gecko is its sticky toes, which enable it to climb things by sticking to them, and scientists have figured out how to harness this feature and put it to use in robotic arms. Researchers have described new applications for a previously-developed gecko-inspired adhesive, which gives robots a better grip on a variety of different types of objects. Researchers with the University of California, San Diego have now announced plans to present their work with gecko-inspired adhesive at the International Conference on Robotics and Automation in Australia next month. They also released a YouTube video showing their adhesive in action (embedded below). The UC San Diego team aimed to solve two main problems when they started working with the adhesive. Their first goal was to ensure that the robotic gripper would be able to stay in contact with any object’s surface at all times. This would fix a common issue that’s experienced with soft fingers that are powered by air, which often bulge while they’re inflated, resulting in less contact with the object they are gripping. Using a decades-old study, the researchers were able to develop equations to fix this issue so that the gripper would be able to apply the right amount of force in each of the fingers. The other problem was to distribute the correct amount of force from the fingers on surfaces which aren’t flat. 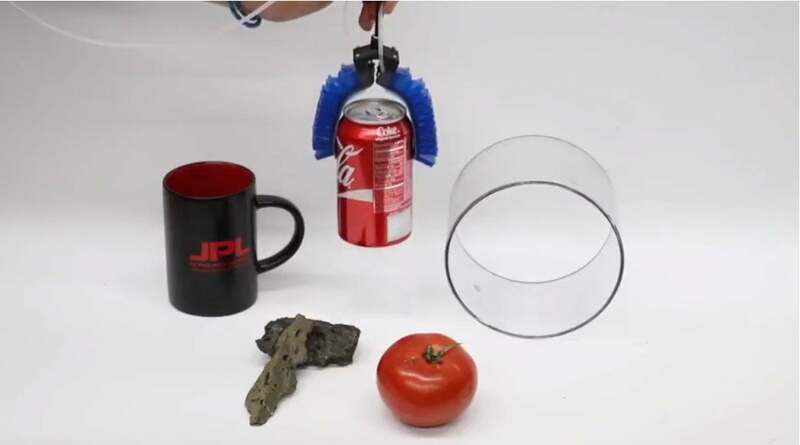 They solved this issue by using a soft gripper that flexes, thus distributing the force where needed around the object being held. In developing their sticky robotic hands, the UC San Diego team built upon work previously done by scientists from NASA’s Jet Propulsion Laboratory and Stanford University. The previous work involved the development of the gecko-inspired adhesive, although they mostly used it on flat surfaces. The UC team built upon that work by applying the adhesive to the fingers of a robotic hand. After the adhesive was applied to the fingers, the robot was able to get a firmer grip on various smooth objects, including everything from mugs and pipes, and it could even rotate the smooth objects to different positions and angles. It could also still grasp rougher objects like rocks. Many scientists consider geckos to be the best climbers in nature, they explained, because of the stickiness of their toes. The small lizards have millions of tiny hairs on their toes, which enable them to stick to any surfaces they want to climb or grip. The tiny hairs work through a process that scientists call van der Waals forces, which enable the gecko to attach and detach to surfaces or objects. Scientists set out to put these van der Waals forces to work by developing a synthetic version of them, and that led to the development of the gecko-inspired adhesive. The UC San Diego researchers said that the robotic gripper equipped with their gecko-inspired adhesive is able to lift objects weighing up to 45 pounds and can be used to grip objects in a variety of different environments, from factories on Earth to the International Space Station in orbit above Earth.